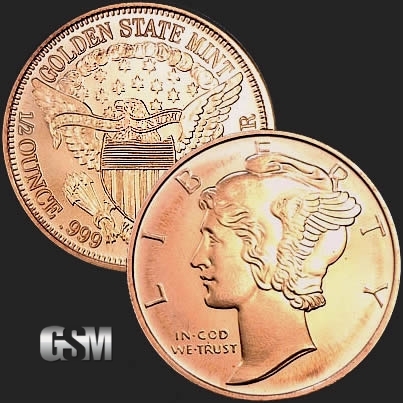 The Golden State Mint 1/2 Oz AVDP Mercury Round imitates the design of the Mercury dime, a ten-cent coin struck by the United States Mint from 1916 to 1945. 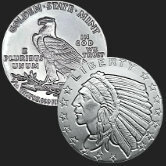 Designed by Adolph Weinman, who also designed the popular Walking Liberty Coin, the obverse of the round depicts lady liberty with a winged Pharygian cap. The reverse portrays an eagle behind a shield grasping an olive branch in its right talon and arrows in its left talon, echoing the Great Seal of the United States. 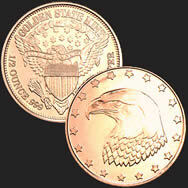 Above the eagle are a series of five-point starts and inscribed are the phrases UNITED STATES OF AMERICA, 1/2 .999 Fine Copper, and E PLURIBUS UNUM (on the banner that the eagle holds in its beak), as well as the mintmark of Golden State Mint. 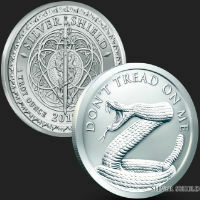 These privately minted rounds or medallions were made in the USA by Golden State Mint. Investors are able to purchase directly from GSM, rather than buying sovereign minted coins which carry a much higher premium as they are sold between middle-men before they're available for retail purchase. Get more for your investment dollar, and purchase rounds or medallions directly from Golden State Mint! If you liked this product, you should check out our 1 oz Copper Mercury Dime, 1 oz Copper Morgan, and 1/4 oz Copper Mercury .